The government has rescheduled Higher Secondary Certificate and its equivalent examinations under all education boards that were due to take place on Sunday and Monday because of the general strike called by the Bangladesh Nationalist Party, an education ministry release said. The Dhaka Zoo on Saturday received 12 new residents of four species, three each of zebra, greater kudu, ostrich and oryx, from South Africa. The Bangabandhu Sheikh Mujib Medical University authorities are pondering on setting up a music therapy centre, a proposal they have recently received from a music teacher. Ferdousi Kazal of Kurigram said her father walked out on her mother during her birth. Although it was too tough to bear the family expenses, her mother — a worker — never put a stop to her daughter’s study. Rajshahi continued their dominance in the first-class competition as they clinched their fourth consecutive National Cricket League title with a crushing nine-wicket victory over Khulna in the final with two days to spare on Saturday. Rajshahi cricket team’s mentor Khaled Mashud attributed the unity between the players and the hunger for success to their victories in four consecutive National Cricket League championships. Tagore exponent Dr Sanjida Khatun received Visva Bharati University’s highest recognition, Deshikottam Award (D Lit), for her contribution to music, on Friday at the university’s convocation ceremony, reported various Indian and local press. Thursday evening, Bangabandhu Conference Centre played host to a constellation of stars and exceptional personalities. The long awaited Meril-Prothom Awards ceremony had finally begun. Siddikur Rahman of Bangladesh made a giant leap on the leaderboard in the Ballantine’s Championship in South Korea with a three-under-par 69 at the Blackstone Resort in Seoul on Saturday. Love has always inspired Nobel Laureate Tagore throughout his life and his works. Inspired by the romanticism in Tagore’s works noted Indian choreographers Madhumanti Maitra and Ashoke Viswanathan have directed a dance drama titled ‘Rabindra Rachonay Tridhara Prem’, which is based on Tagore’s works. Mostafiz Karigar presents his inner contemplation on different issues relevant to human life in his debut art show titled ‘Cycling in Circle’ at the La Galerie of Alliance Française de Dhaka. A three-day college level divisional drama festival, on the liberation war, started at Barisal Aswani Kumar Hall on Friday night. Bangladesh Shilpakala Academy has organised the festival as part of its year-long, nationwide programme to celebrate 40 years of independence of the country. A decade has passed since Jaya Ahsan’s emergence, during which she has turned her journey into a success story only a few artistes can emulate. Be it TV plays, modeling or movies — Jaya came, saw and conquered all with her extraordinary abilities. Session jam, teacher crisis, irregular classes and hence poor results have put at stake the future of 365 BSc course students of Chittagong Nursing College. Established in 2007, the college is yet to produce its first batch of graduates. 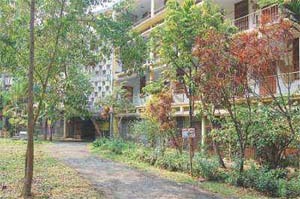 As for the academic progress, only six out of 51 students of the second batch (session 2008-09) came out successful in the second-year mid-term exams, according to the results published on February 16. 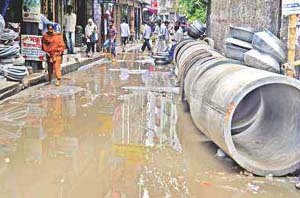 The Dhaka Water Supply and Sewerage Authority (Wasa) has embarked on digging up 26 kilometre of road of the capital to lay utility pipelines but the work is progressing at a pathetic pace catching up the rainy season. In addition to the misery, the Dhaka north and south city corporations (DCC) remain indifferent as usual about taking care of the roads left in a shambles by different utility agencies after development works.